4K TV has been gradually moved towards to an era of 4K video standard, which means 4K videos are widely used and popular by and by. But many 4K TV users encountered a problem that some videos are not allowed to play on 4K TVs on account of the unsupported 4k format. Here comes the issue: what are 4K video formats on earth? But before this we need make clear what is 4K? It refers to a resolution (4096×2160 pixels or 3840×2160 pixels) instead of a video format, which confused many people. So briefly if the video resolution reaches to 2160p, it's absolutely a 4K video no matter what formats the video is encapsulated in. In other words, 4K video formats are board. For example, MP4, MKV, MOV, AVI etc. all can be 4K file formats. It supports 320+ video and 50+ audio codecs and 180+ video formats, letting you convert 4K HEVC to 4K MP4, H.265 to H.264, MKV to 2K MP4, AVI to MOV etc. With 350+ preset profiles, this 4K video converter enables you to directly convert 4K videos to iPhone XR/Xs/Xs Max, iPad, Android, iMovie, iTunes, Apple TV, QuickTime, so that you're able to play 4K on VLC, QuickTime 4K video players, 4K UHD TVs or other 4K devices. The 4K video converter also allows you to change video resolution. No matter you wanna compress 4K to 1080p/720p, or upscale 1080p to 4K, 720p to 4K etc. With advanced "Auto Copy" mode, you can directly copy 4K video audio streams and subtitles from one container format to another one without decoding/re-encoding. For instance, copy 4K H264 video from MKV to MP4 and you can get output 4K MP4 with 1:1 original quality at 10X faster speed. [Optional] The former mentioned 4K UHD video converter is designed for macOS users. If you wanna convert 4K resolution video to 4K video formats on PC, please resort to MacX HD Video Converter Pro for Windows version. Actually, since the board range of video formats for 4K resolution and the continuous developments of 4K UHD devices, you cannot accurately find out 4K UHD videos formats but a rough list for the present instead. What's format of your 4K video? Here we go for the most common 4K video formats, applying to the different sences. 1. MP4. Firstly, MP4 is a video container, which involves codecs like MPEG-4, H.264, HEVC, VP9 etc. And according to the wide compatibility of HEVC/H.265, H.264/AVCHD, MPEG-4, major 4K videos are in MP4 format indeed. Thus, no matter you wanna pocket 4K videos on iPhone iPad Android device, play 4K videos on Mac with VLC, QuickTime 4K UHD video players or stream 4K to 4K UHD TVs, it's a safe belt to convert 4K to MP4 with 4K converter for TV. 2. MTS/M2TS. MTS/M2TS is a filename extension used for the Blu-ray Disc Audio-Video (BDAV) MPEG-2 Transport Stream (M2TS) container file format. It is used for multiplexing audio, video and other streams. This container format is commonly used for high definition video on Blu-ray Disc and AVCHD. As for 4K resolution, MTS/M2TS are mainly produced by Sony, Canon, Panasonic 4K cameras and camcorders. Besides, these camcorders also record 4K videos in MPG, MPE, MPEG, ASF, MOD as well. 3. MKV. MKV (Matroska Multimedia Container) is another 4K video format encoded with HEVC/H.265 codec or VP9 codec. It is similar in concept to other containers like AVI, MP4, or ASF, but entirely open. MKV involves an unlimited number of video, audio, picture, or subtitle tracks in one file. But actually, MKV 4K video format is not as compatible as MP4 4K, so if you encounter any MKV 4K won't play issue, you can convert MKV to MP4 for a better compatibility. 4. AVCHD. The result of a Sony and Panasonic collaboration as a video file format for digital camcorders, AVCHD is commonly used for data compressed with the H.264 codec. It supports both standard definition and high definition variants and supports 3D. Moreover, Sony, Panasonic, Canon, JVC all produced some high-end HD camcorders enabling you to record 4K UHD video file in AVCHD format. Well, the above list does not include all video formats for 4K resolution. 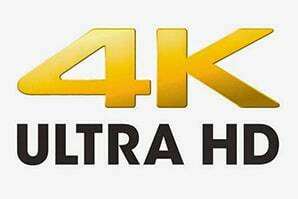 As a matter of fact, there is a big difference of 4K video formats among different 4K TVs like Samsung, LG and Sony. To make it clear, you can go through the details of 4K TV supported formats. 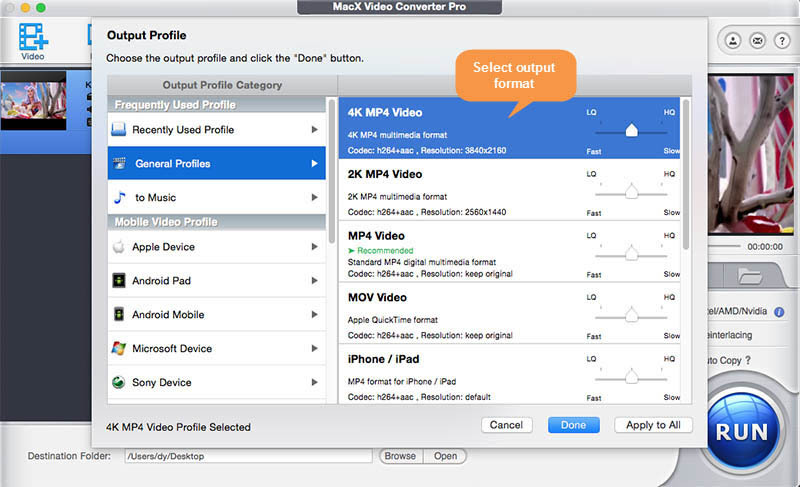 Step 1: Free download the 4K UHD video converter on Mac or Windows version for PCs and run it on your computer. Click "Add Files" button to import the 4K video. Step 2: Choose one of the 4K video formats as the output format from the automatically popped-up window. Click "4K MP4" from "General Profile" to find out the final output format. Note: In view of there have the needs to play 4K video on iPhone iPad Android, you are also suggested to convert 4K to 1080P, 720P etc. in MP4 so that you can enjoy your 4K video freely. Step 3: Click "Browse" button to specify the output path for saving the converted 4K video. Step 4: Hit "RUN" button to start the super fast 4K video converting process. And you are free to pause or stop the converting process anytime even if you have started converting. Notes: By the way, if you have a computer with good configuration and precisely choose the output formats with H.264 codec, you could enjoyed a 2-3 times faster speed than formats other in codecs. A fresh technology call Intel QSV/Nvidia/AMD hardware acceleration will enable you to shorten the never have been long converting process only if you check the box of "Intel" on bottom right above "RUN" button. Unable to Play 4K UHD Videos? Not Really! Convert to common 4K video formats, like MP4, MKV, MOV, MTS encoded with H.264 or MPEG2 codecs. Fall back on professional 4K video players on your Mac or Windows PC. 5KPlayer, VLC, Media Player Classic, Sony 4K Ultra HD Media Player are all best bets. Compress 4K UHD videos to lower resolution (1080p/720p, for example) so as to enjoy on moblie devices or weaker laptops.